Go anywhere you want, clean everywhere you need. GoFree! *Please note: This item contains Lithium Polymer batteries, which are considered to be a hazardous material for shipping purposes. As such, this item will ship directly from the Factory to your location. In addition, due to demand, these units are currently being built to order. Please allow 1-2 weeks for delivery. 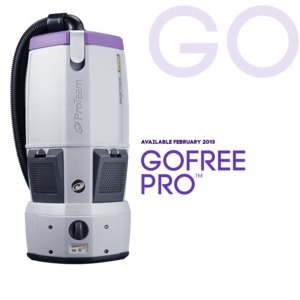 ProTeam - 107397 - GoFree Flex Pro Cordless Backpack Vacuum now with a 14% weight savings with new efficient motor ideal for routine cleaning. Working without restrictions means going wherever you need to go to get the job done. Now, ProTeam adds comfort to cordless in our most powerful battery-powered backpack vacuum ever. We know that when cleaning pros feel better physically, they’re more productive. The new triangular shape combined with our patent pending FlexFit® articulating harness has resulted in a vacuum that feels more like a part of your body. An easy-read charge status or lighted display allows you to see charge levels on-the-go. Even the charger is engineered for productivity. Instead of a charger station, you can take it anywhere you need to go, so you can charge it on the go. ProTeam is famous for filtration. Our new generation of backpack vacuums continues to provide the highest level of industry-leading filtration available. Our HEPA Level Filtration™ removes 99.97% of dirt and allergens .3 micron or larger from flooring and surfaces. One noticeable improvement is the ease with which you can perform routine filter maintenance or change filters. Improving comfort isn’t all about weight, balance and shape. ProTeam’s new backpack vacuums are so well built and insulated, they reduce the noise. Less noise means less impact on others who may be in the vicinity. Technology at its best makes life easier. If you can empty your contents more quickly, or change filters faster, you can spend more time cleaning. The latch system on our new vacuums is simply fuss-proof. There are no tools required. And while we were making things easier, we also developed a way to improve overall performance of the vacuum by creating a better, tighter seal improving pressure, power and performance. Bending, squatting, twisting, stretching, extending– it’s not a yoga class. These are movements professional cleaners go through multiple times a day. Cleaning hard to reach places is difficult enough, but when you’re off balance, you’re at a greater risk of injury. ProTeam has engineered their next generation of backpack vacuums to keep you balanced and feeling in control. By adding a pivotal ball joint, the vacuum moves effortlessly with you. It dramatically improves your physical range, so you can manage those hard-to-reach places with less effort?